Table saws come in several types, but you may find yourself gravitating towards the best hybrid table saw you can get. The problem is that with a contractor saw, you’re limited by its very basic capacity and features. On the other hand, the powerful and robust cabinet saws are rather too expensive for DIY hobbyists and even for small contractors. 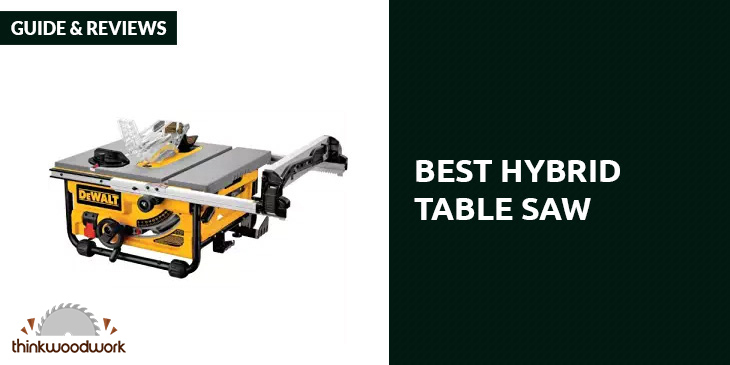 These are the reasons why hy﻿brid table saws are so popular. The price may resemble what you find with contractor saws, but some of the features of a hybrid can also be found on cabinet saws as well. In other words, you get the best of both worlds. 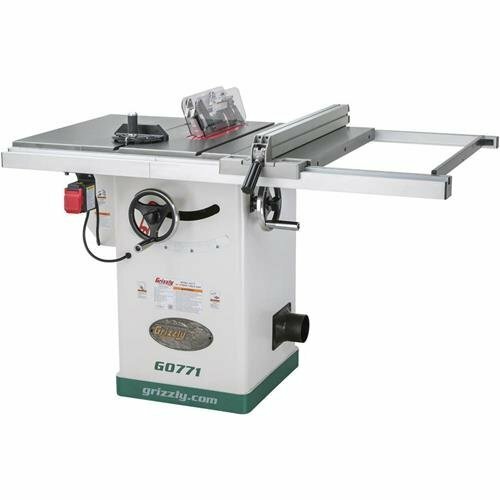 The Grizzly﻿ G0771 is a hybrid table saw that’s actually as light as many contractor saws. It only weighs 286 pounds, so you and a bunch of friends can still move this around in your workshop. It’s very light on your budget too, as it’s the most affordable table saw on this list. But it sure isn’t light on features, and some of these features are similar to what you’ll find on cabinet saws. It’s also very easy to set up, as previous mistakes in the manual have since been corrected. Like some cabinet saws, this hybrid has an enclosed cabinet with a 4-inch dust port, and you have heavy-duty cast-iron trunnions that mount to the cabinet. The cabinet improves durability and reduces vibration. The cabinet enclosure and dust port also improves the dust collection. And trunnions mounted on cabinets are easier to adjust than trunnions mounted on tables. The trunnion, by the way, is the mechanism that fits in the saw blade mount. It’s also the mechanism that enables height and tilt adjustment. You’ll find the power sufficient with the 2-HP motor so you can easily go through hard wood or cut a dado. Just make sure that it’s located near a power socket, as the power cord is just 6 feet long. The fence of this saw also has some great features too. It’s very simple to adjust, and you get the easy lift-off you want. The front and rear locking ability is very solid and you also get accessory T-slots. Most of all, it comes with a nice quick-release blade guard and riving knife system, so you can change blades in just a few seconds. The maximum blade diameter is 10 inches. The spec sheet for the Shop Fox W1837 Hybrid Table Saw reads almost the same as that of the Grizzly G0771. It offers the same blade tilt angle range, rip capacity, and motor capacity. It also has an enclosed cabinet with a 4-inch dust port, and the trunnions mount to the cabinet. You may like that the quick-change blade guard here has anti-kickback pawls which you can position away from your wood. This helps in preventing kickback injuries, as they comprise most of the 31,400 table saw injuries treated in ER wards each year. Another safety feature is the clears guard, which lets you oversee the blade cutting the wood while you still have a shield around the blade that keeps you from accidentally touching the blade. It also contains any flying debris from the blade. There’s also a nifty built-in mobile base which you can engage simply by pushing down on the foot levers. The machine then rises and you can move them on their wheel base to a new location in your work shop. So even though it weighs 243 pounds, it’s actually easy to move even on your own. Like most other hybrid table saws, this can tilt by 45 degrees. Adjusting your cutting angle starts with loosening the blade tilt lock. You can then turn the blade tilt handwheel to get the blade at the angle you want. Then you can lock it in place, and you can make your cuts consistently. So if you’re cutting dadoes or working on hard wood, this is also a good choice. The portability is nice, and you also get a 2-year warranty. 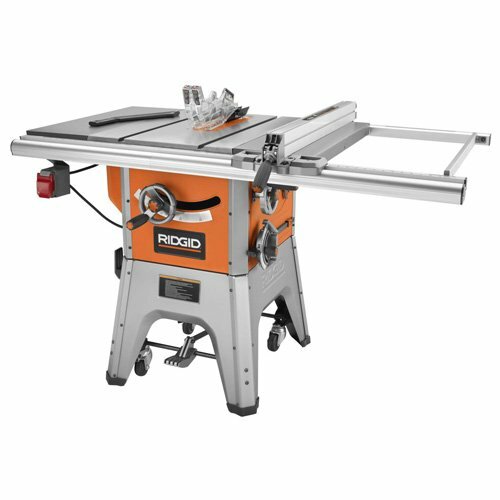 The Ridgid R4512 Professional Table Saw is another 10-inch hybrid table saw that offers a lot of benefits for very reasonable price tag. The assembly can take a while, and it can last about 4 hours until you do it right. Fortunately, the assembly manual is quite understandable, and it even explains how you can install in future accessories you may want for this hybrid. The motor is enclosed, of course, and it’s wired for 110 volts. But the manual also explains how you can convert it to 220 volts. It’ll take you only 10 minutes, and it’s very much worth the extra effort if you can run it at 220 volts. It’s very quiet, which is surprising, and it doesn’t produce a lot of vibration. It’s very solid, with steel extension wings and cast iron for the center part of the table. The fence is excellent, as it locks square and it runs smooth as silk on the rails. This is a fence you definitely don’t need to upgrade. For your safety, the blade safety devices are also very east to put back on, or to take off for that matter. Sometimes there’s a special task you have to do that requires the removal of these devices, and a lot of injuries occur because you neglect to put them back on. Now you can’t say that it’s too tedious to put them back on, because it only takes a few seconds to do so. Finally, it also has a mobile base. So moving the saw around is easy. Just make sure that you account for the power cord, as it’s only 6 feet long. 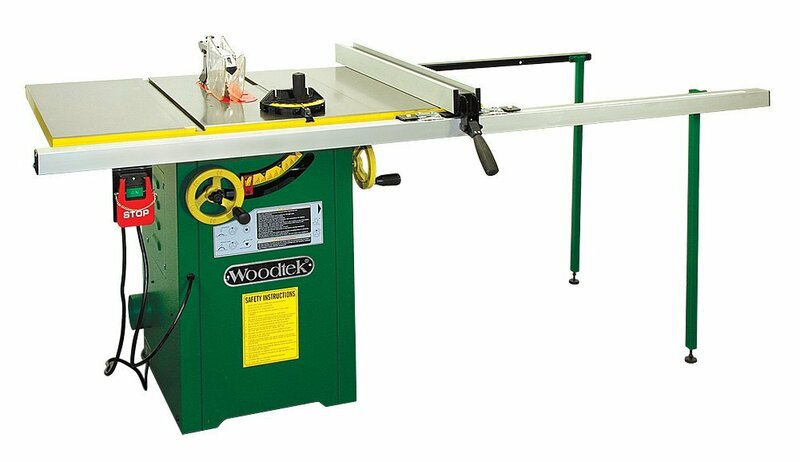 If you’re a beginner with wood working, you’ll be amazed at how better you’ll seem once you have the Woodteck 159665 Table Saw in your work shop. It seems designed to make everything easy for you, so you don’t need to work all that hard in figuring things out. It all starts with the simple assembly. If you’ve already assembled a table saw before, then setting up this one is a piece of cake. And if it’s your first time, you’ll find that putting it all together seems almost intuitive. Once you have the assembly completed, you have every basic feature that all the good hybrid models have. So to be specific, the blade diameter is 10 inches, the blade tilts 45 degrees, the table size is ample at 27 by 44 inches, and the table height is standard at 35 inches. The depth of the cut at 90 degrees is the usual 3.25 inches, while you get 2 inches of depth when you cut at 45 degrees. The maximum rip capacity is 30 inches, the dado width is 13/16 of an inch at the most, and the dust port measures 4 inches. Basically, with this you can immediately work with your wood working projects, as it is versatile and easy to use. You have a clear blade guard, and the dust shroud captures the dust directly from the blade. While you don’t get the mobile base, with a few friends you can move it around as it weighs just 225 pounds. 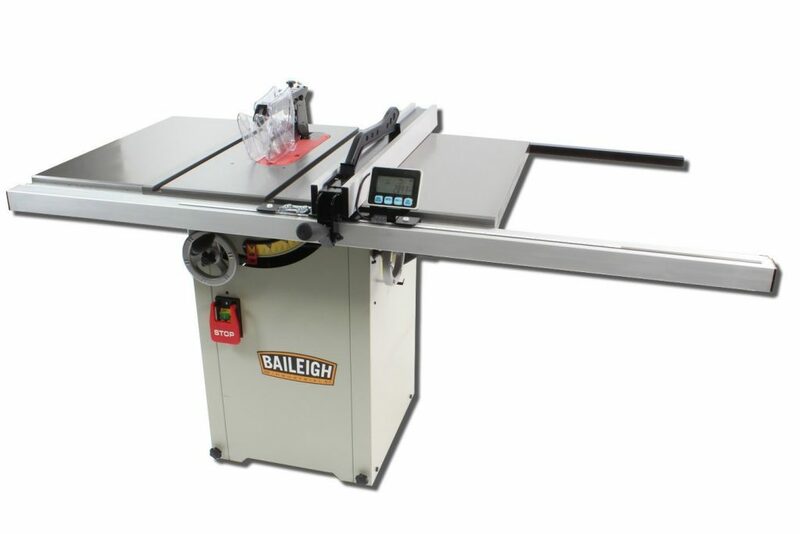 Now if you have the budget, you can really enjoy your wood work with the Baileigh TS-1044H full-featured hybrid table saw. But you have to be prepared to pay 3 times as much as the others on this list. On the other hand, you do get a lot for your money. First off, the motor is a bit more powerful than the others. While those other motors turn at the usual 3450 rpm, this one offers 4000 rpm. It can also run on either 110 or 220 volts. It’s also easy to go about finding the perfect spot for this, since it has built in wheels to help you move it around your work shop. The table is also huge at 44 by 27 inches, and it’s made of cast iron. The maximum rip cut is 36 inches instead of 30. The rip fence is also heavy duty, and it even has a unique digital readout for the rip capacity. This means you no longer have to second guess the exact length of the cut. Just zero the digital readout at the blade, and you can begin. Add the basic features such as the cabinet enclosure, the miter gauge, the 4-inch dust collection port, and the zero clearance table inserts, and you have a heck of a hybrid table saw. As you can see, there’s a lot of leeway as to how your hybrid table saw can fit your budget. But even the most affordable is an excellent addition to your tool lineup. 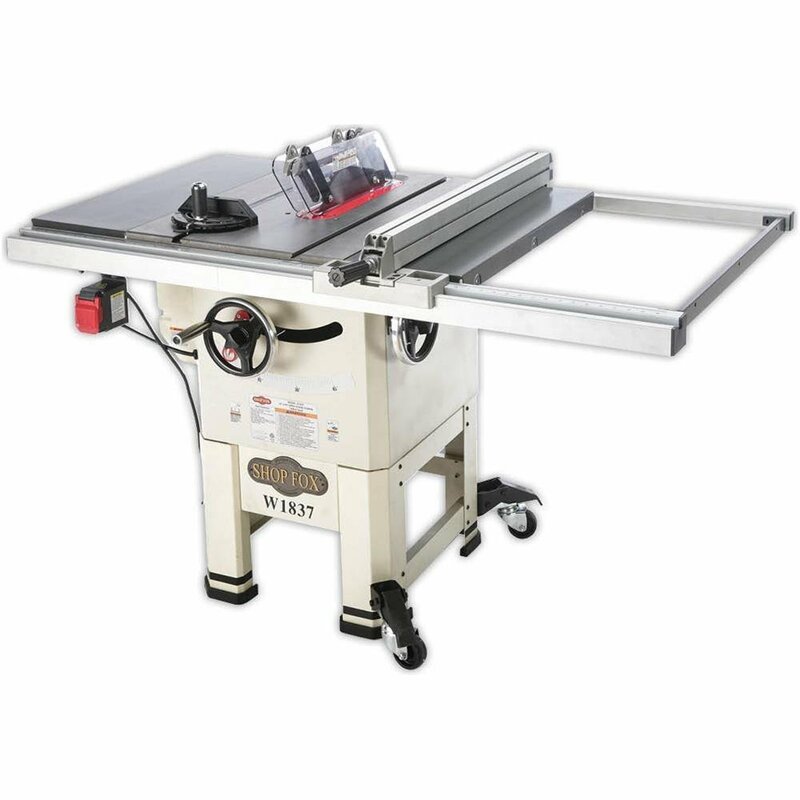 Get the best hybrid table saw for your work shop and you can enjoy efficient cutting without too much noise and dust. They’re very sturdy, safe, easy to use, and durable. For the serious DIY hobbyist, it’s the wave of the future.